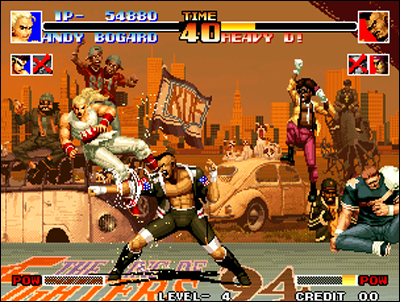 Fatal Fury 2 / Street Fighter II CE: the war has begun! 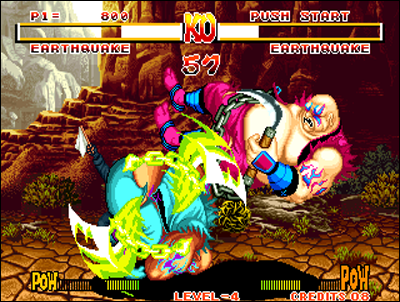 Art of Fighting / World Heroes: among 92' best fighting games. 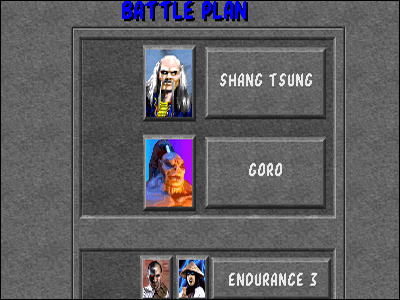 But the title that most likely marked the players in 92, is undoubtedly Mortal Kombat. 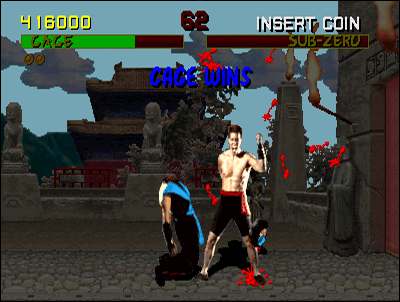 Midway carries a 100% digitized fighting game: backgrounds and fighters are designed in a hyper-realistic style and are made through motion capture, a technique to film real actors performing the movements. 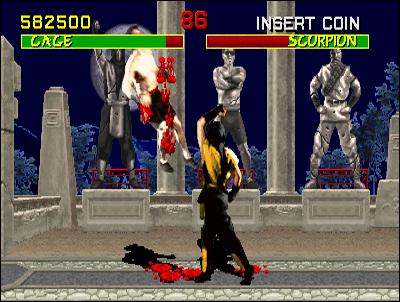 The game declines as VS Fighting around extreme violence, giving a gory dimension to the battles and dramatic atmosphere that were never seen before. The gameplay is simple yet addictive, and there are enough selectable fighters even for demanding players (seven in total). A phenomenal success in the gaming rooms, adapted to almost all platforms. 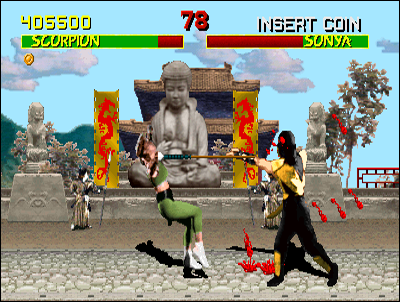 Mortal Kombat introduces ultra-violence in fighting games. 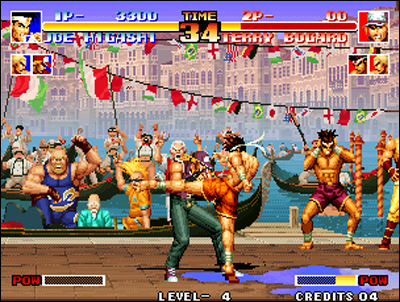 Note that this is also the year when the Super NES receives Street Fighter II's successful adaptation, and that this one will not only boost sales of the console, but also considerably popularize Capcom's game. Sales get through the roof, setting new world sales records, and the Nintendo machine access the highest step of the the best-selling 16-bit podium. Gender literally takes off in 1993, with no less than twenty-eight new titles, excluding ports. This is the most fertile years since the Versus Fighting genre exists. Quite remarkable innovations are emerging, and some major publishers (some that already tried VS games before) align their babies in the competition. Sega double misses its entrance with two totally crappy games: Burning Rival and Dark Edge. The first, like many mediocrities of its kind, is extremely steep, with a bland gameplay and completely missed design. As for the second, it's using 3D backgrounds... with flat 2d sprites. A true absurdity gone relatively unnoticed. Surprising from an editor like Sega... but after all, it's very difficult to be an expert in several domains simultaneously. Bandai releases two games based on a very popular license: Dragon Ball Z Super Butouden and Dragon Ball Z Super Butouden 2. 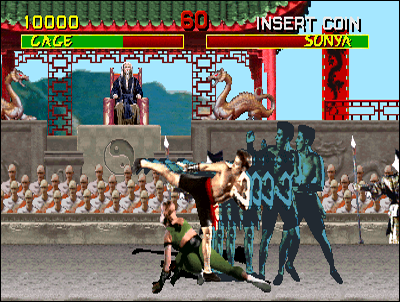 Softwares are using split screen so that characters can move away from each other, and perform their enormous fireballs away from each other. Despite some good ideas, games are sloppy and we feel that the programmers rested on the strength of its license. Moreover, despite some rave critics, these games sold like hotcakes, causing the delight of fans! DBZ on Super NES, or how a big license allows to totally botch a game! Fighter's History / Martial Champion, two sympathic games... no less, no more. Always on the side of 100% new games, Atlus releases Power Instinct. First installment in a saga that lasted more than a decade, this first episode offered a very good realization coupled with interesting gameplay, and an atmosphere especially fun! The characters are endearing, game quirky and fun, with a completely crazy soundtrack. Another original creation of this remarkable 1993 vintage is Clay Fighter. 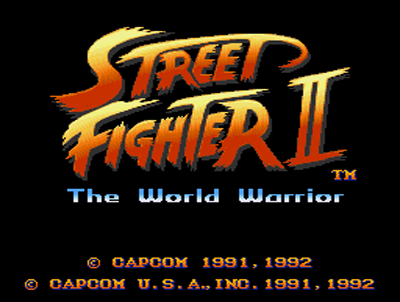 Developed on the Super NES, the title depicts warriors made ​​of clay... and it stands as a very good fighting game! Namco is also trying to sort with Knuckle Heads... The novelty is that you can play four simultaneously, but separately from this, the app seems to arrive straight out of the eighties with its "3d" gameplay and its sickl stiffness. Discription for the publisher, which will only return three years later with real 3d. Fun is back with Power Instinct and Clay Fighter. 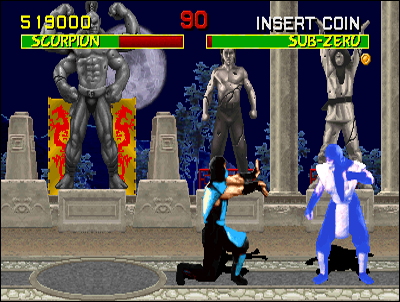 Heavyweights side now, we are granted the sequels of previous years' greatest hits: Mortal Kombat II arrives in the arcades and is even more impressive than its predecessor. Graphics, animation and sound have been improved, the roster expanded and hundreds of liters of blood added. Midway has became a major fighting game editor at this time, it's now indisputable. 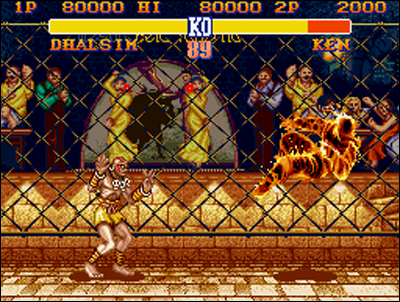 Sega draws inspiration from them for their first Genesis VS Fighting game, Eternal Champions. 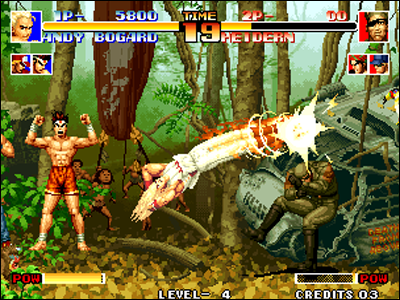 Aesthetically closer to Street Fighter II, the game features impressive gore scenes and unhealthy atmosphere... without equalling the Midway game, and even less Capcom's ones. Besides, this latter completely renovated its legendary saga, with Super Street Fighter II. 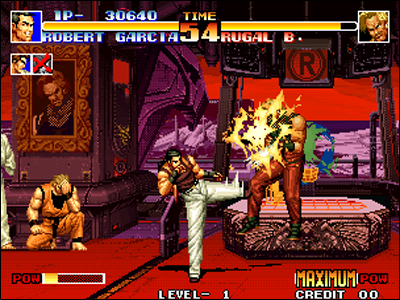 Not only the game now runs on new powerful arcade hardware (CPS-II), but it also offers better graphics, refined music, and four new characters bringing the total to sixteen. This game's rival arrives next to Fatal Fury 2, it's Fatal Fury Special. SNK did not skimp and added no less than eight new playable fighters in the game (15+1 hidden) while they significantly improved the gameplay, now integrating combos to the series. The title is on a par with SSFII and Osaka firm finally emerges as the biggest rival of Capcom. Fatal Fury Special VS Super Street Fighter II: titans battle! 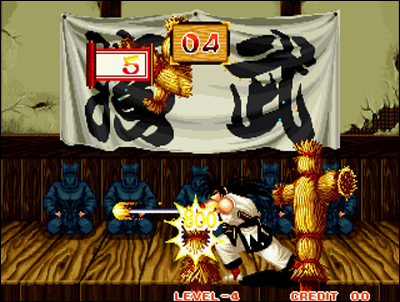 But that's not all ... SNK really hit hard during this year 1993, and another title will impress all players around the world and make history: I'm of course talking about Samurai Shodown. Voted game of the year, its action took place in the samurai era, featuring epic blades fights. The realization is sumptuous with powerful zooms, incredibly beautiful graphics and a simply outstanding soundtrack. The gore is also present, with blood and character slicings in every way... SS knew a resounding success, and the editor begins to carve out a first class reputation in the world of arcade. 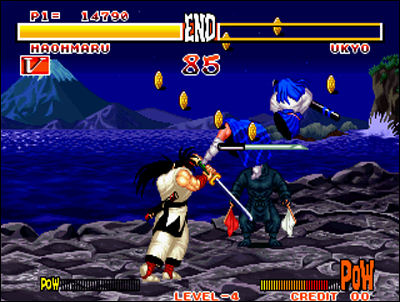 Samurai Shodown brings fresh blood to VS Fighting. 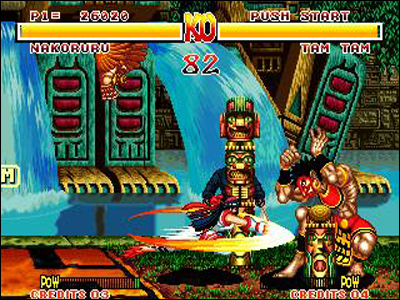 1994: it's the outbid, no less than forty-two 2D titles were born this year, while the first 3d fighting games appear. Right in the beginning of the year, Sega invades arcades with Virtua Fighter. The game takes advantage of the astronomical capabilities of Sega Model-1, a machine capable of handling tri-dimensional graphics as few other systems at the time can. Popular enthusiasm quickly appears around the game: for the first time, backgrounds and characters are completely modeled in 3D and combats use this third dimension! The game tends to be realistic both in its appearance as in its mechanisms. 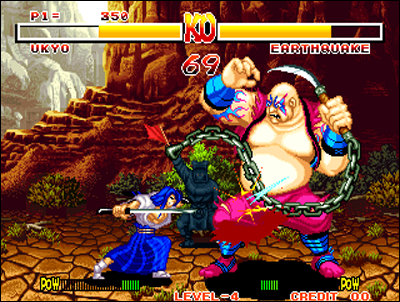 It features warriors using various martial arts, very different from each other. The integration of real 3d marvel as it was never seen before, and if the gameplay seems with hindsight, more basic than in Fatal Fury Special or Super Street Fighter II, success is huge and the audience is captured . So Sega comes back to the to the highest peaks of the gaming rooms. At the end of the year, the editor already releases the second installment of VF, offering two new characters and improved graphics. Competition doesn't have them waiting long and takes shape under the aegis of Namco, who prepared a proportional response to the giant Virtua Fighter from Sega, and immediately stands out as a very serious rival with a very impressive game: Tekken. The editor uses a home hardware house equalling Model-1's power, it's the Namco System 11. Less 'realistic' than its rival in its gaùeplay, the soft wants to be spectacular and fun, and experiences an instant success. 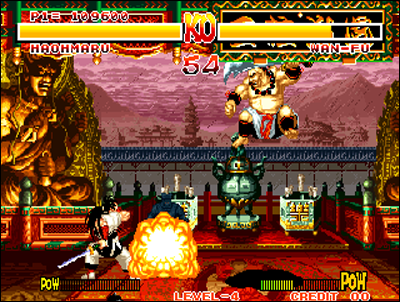 Namco's Tekken encounters a great success and is ported on 32-bit systems. Meanwhile, the 'Success Story' continues. 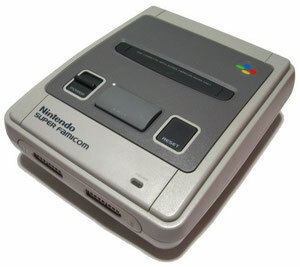 That same year, players are entitled to Super Street Fighter II X (ultimate version of the saga), Samurai Spirits II, Art of Fighting 2, Karnov's Revenge (sequel to Fighter's History, the controversial game), but also Power Instinct 2, World Heroes 2 Jet, and a new episode of DBZ on the Super NES - still mediocre - with Dragon Ball Z Super Butouden 3. What a lovely variegated! The least we can say is that there's choice for every taste. SNK and Capcom share top billing with their legendary sagas, and improve once more their reputations. But other surprises still await the public, as both firms havesome startling news in reserve that year. Samurai II & Super Street II X, the cream of the crop! 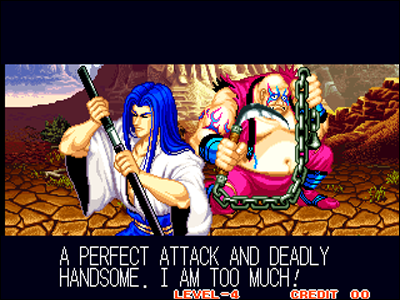 Power Instinct 2 & Karnov's Revenge play the minor figures. Brand new franchises make their appearance, and not least. Capcom's Darkstalkers is launched: it's a game featuring supernatural characters and vampires in a medievalo-fantastico-creepy atmosphere looking great. The game is graphically rich and pretty different from a lot of other series of the editor, in terms of gameplay. Like SNK, it seems that Capcom tends to expand its range to reach the widest audience possible. It's probably for this reason that X-Men: Children of the Atom is also released: a Marvel licensed game featuring Comic's heroes such as Wolverine, Cyclops or Storm. It's straight forward, beautiful, spectacular and fans of button-and-stick--mashing are in paradise with this luxurious défouloir. Darkstalkers and X-Men, Capcom gives in the fantastic register! SNK on its side produces only one new franchise, but it will mark with a hot iron the world of Versus Fighting. 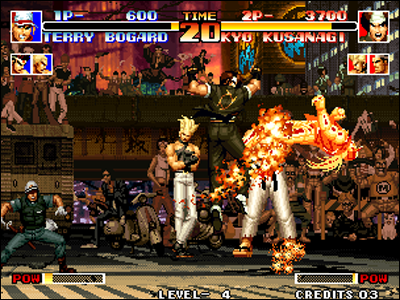 The King of Fighters 94 'is the first 'crossover' in the history of fighting games: heroes of Fatal Fury and Art of Fighting series meet during a martial arts tournament, pleasing the dream of all fans! 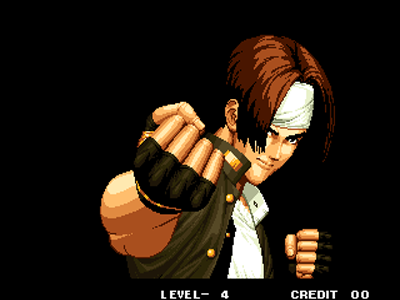 Characters belonging to the saga make their appearance, as Kyo Kusanagi, Heidern, Daimon, Chang... and if the game starts from scratch with its graphic style, the gameplay is also a revolution: you can play with a team of three fighters whose order of passage is adjustable. The game is accurate, fast, full of combos and special moves. A stringent timing is required, and the technicality is in the spotlight as never before. In addition, SNK sets the largest rosters ever offered in a fighting game: no less than twenty-four different warriors are available! 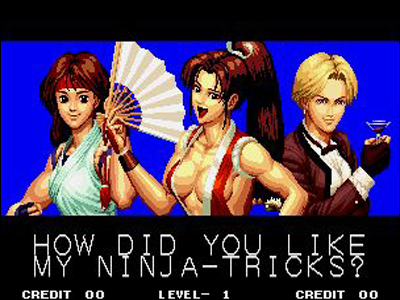 KOF 94' is the beginning of a VS Fighting legendary saga.